You see them while scrolling through your Twitter account. You read them in your Facebook timeline. You may even spot a few on LinkedIn. They’re helpful, funny, or thought provoking. They’re shareable graphics, and they’re here to stay. These graphics combine information with design. They are exceedingly popular on social media. And, you can create and leverage them for your agency's social media. Scared by the word create? Don’t be! There’s plenty of help to get you started. What information will you share? Don’t just post anything. Your agency’s social media accounts put a friendly face to the name. They can foster trust and build relationships online. You want to post advice, help solve a problem, or inspire your readership to take action. So you’ve gotten to this point and you’re still wondering, "How do I actually create these graphics?" I promise I won’t leave you without some awesome tools to help you with this grand project. There are a ton of tools out there like Stencil, PicMonkey, and Photoshop. Each have their pluses and minuses, but none are free. Which brings me to my favorite, Canva. Canva is a website that allows novice designers to create attractive designs. In fact, the header image for this blog post was created in Canva. The best part: Canva is free! Now, like everything else in the world, there are extras you can pay for. But, there’s so much free-ness in Canva you shouldn’t need to pay for anything. This web tool has a template for everything. There are templates for Twitter headers, Facebook posts, and even tri-fold brochures. There are photos, backgrounds, shapes, and icons for you to use. You can also upload your own logo file. They have tutorials and guides, too, including their own online Design School. Everything about Canva is great for beginners. Take a moment to click around and see how easy it is to create something. Being consistent doesn’t mean slapping your logo on everything. Yes, if you want people to know something is yours, your logo should be present. But, consistency goes beyond that. In the world of social media, consistency looks a little different. To be consistent in social media you need to post regularly, and often. Even better if you post near popular times of the day. Make a posting schedule and stick to it. This infographic from Fast Company can help you plan the timing of your posts. Eventually, your followers will get used to seeing your posts and remember you. Your agency will be in mind if they need what you provide. Now, go use these 3 steps I’ve just shared with you, and create something fun! Have you created something awesome for your agency? Share it below for us to see! 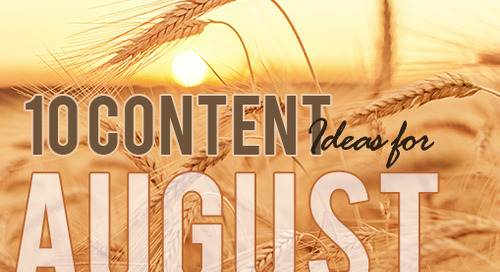 These 10 content ideas are perfect for your agency's August newsletter, blog posts, or social media.